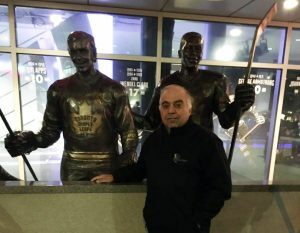 Grandravine’s president and long time Blackhawks fan, Joe Rizzuto, was spotted at the Leafs-Bruins Hall of Fame game Friday night. There he was, hanging out with all his leaf buddies in the Maple Leafs alumni box at ACC. 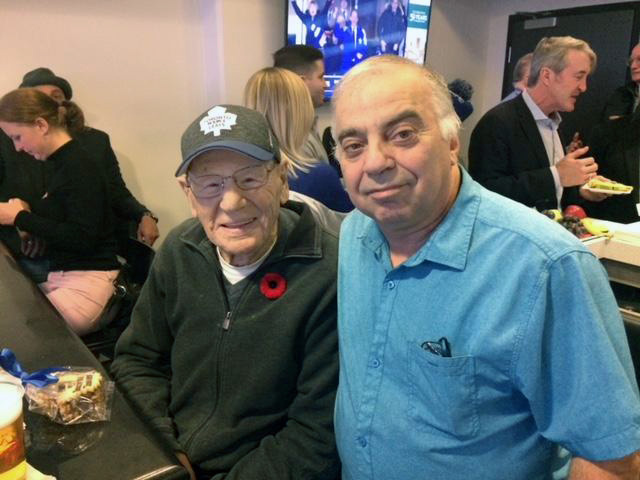 Joe Rizzuto with Johnny Bower at the Leafs Alumni box. Is it possible that he has turned blue and white? Perhaps it’s not not only the maple leafs in his own back yard that he is now admiring. And is this a picture of Joe paying homage to some of the Leaf past greats? Joe Rizzuto standing with pride on Legends Row at the ACC. Despite repeated denials from Joe himself, one has to wonder, “Where there’s smoke, there must be fire!” Has he finally seen the light? Has he finally abandoned the Hawks? With so many others coming clean about past foibles, could Joe be trying to rid himself of his addiction to the dark side of Chicago. Remember Joe, we’re here for you. Blackhawks management could not be reached for comment.